With Unpivot Table for Excel, you can swiftly transform your crosstab (pivot table) to a one-dimensional list and save the result to another worksheet or workbook, without corrupting the original data. Make a flat table to add new information, improve its layout, or rearrange your data for printing or further analysis. 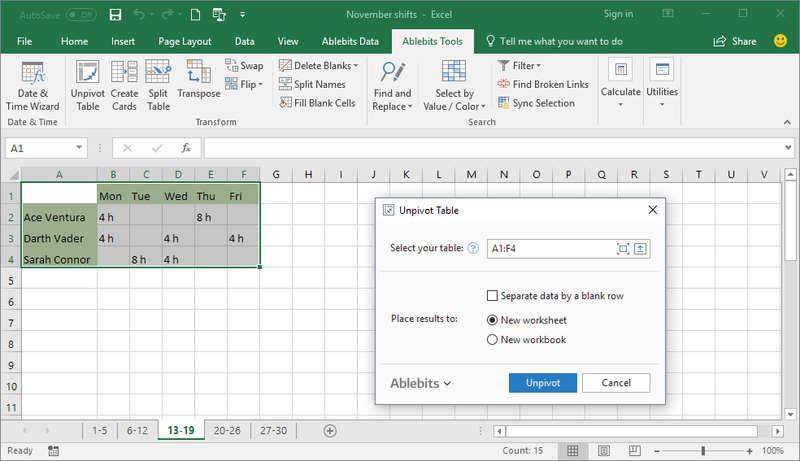 Reshape tables to a flat listUnpivot Excel table to get the information in a tabular format instead of a summary spreadsheet. Separate data by a blank row when neededA blank row will be added before each group of values to make the results better readable. 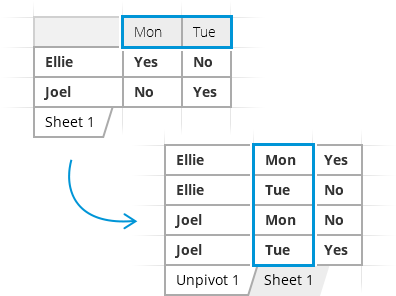 Unpivot any part of your table Have the tool choose your entire table automatically, or select the desired range manually if needed. Decide where to put the resultChoose to place your normalized Excel table to a new worksheet or workbook. What is Unpivot Table and what do I need it for? crosstab table. If you often analyze large datasets and prepare visual representations, Unpivot in Excel will become your tool. It also helps to modify the layout of your pivot table in order to create charts and graphs. It involves no coding or sophisticated formulas. Just several clicks for getting a reverse pivot list. The only Microsoft tool that is capable of unpivoting is Power Query. However, it's built into Excel 2016 only. 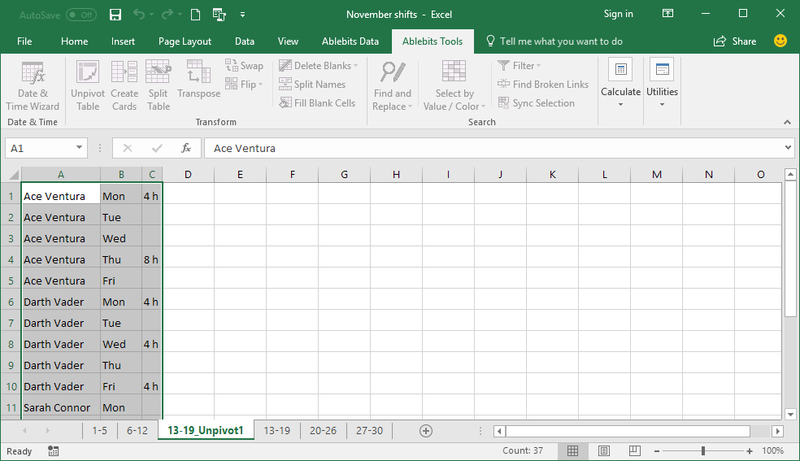 Though it can be downloaded to Excel 2013-2010, it works as a separate editor with many tabs that you'll have to go through and contains other unnecessary for unpivoting options. In addition, your data should be formatted as a table, and you'll need to manually select all your columns and confirm saving the result. How does Unpivot Table work? Select any cell of your table and run Unpivot Table. Adjust the selected data range if needed. Check the option to separate data by a blank row if you want to. Choose where to put the result: to a new worksheet or a workbook. Can't I just transpose my original table? No, transpose is a completely different operation. It simply converts rows into columns and vice versa. What will happen to my original table? Will it be overwritten with another flat one? No, depending on the options you select, the add-in will place the result either to a new worksheet or a new workbook. Your original table will remain intact.